Cityserve Pay has arrived at your school! Birmingham City Council has partnered with sQuid Online Payments to create Cityserve Pay - a fast, convenient and secure way for you to pay for your child's school meals, trips and other offers. You should have received a registration letter from your child's school which contains your own unique 16 digit sQuid registration number and a 3 digit security code. You need to create an account and then enter these numbers to complete your registration. You will then be able to top up your account, make payments and view your balance and transactions. Your account can have more than one purse. A purse is a simple way to split out the different things you may want to pay for. For example a Catering purse to pay for school dinners and a Trips & Offers purse to pay for school trips, offers and other school items. It is important to make sure you top-up the correct purse. Top-up your child's cashless catering purse online, so that they can then pay for their lunch or a snack from the school canteen. Top-up by bank transfer, or from a credit or debit card. If your child's school has enabled online payments for school trips you will also see this purse on your online account. In this purse, you can view and pay for your child's school trips, clubs and other school offers. Pay online using a credit or debit card, or by bank transfer. 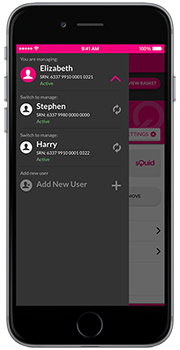 The sQuid mobile App is free to download on iOS and Android devices and provides a quicker, more convenient way to access, manage and top up your online account. Top up your account or pay for School Trips & Offers, quickly and easily, in a few simple steps - or enable Auto top up so that you never run out of funds. Access and manage multiple accounts using one login with the App. Manage your account spend and view your transactions anywhere: on the sofa, on your lunch break, or even at the shops! To download the sQuid mobile App on iOS and Android devices, please click on the appropriate download links below, or search for 'sQuidcard' in the relevant stores. More than one child using Cityserve Pay? the 'Add user' option on the 'Users' page. Don't forget to assign a display name so you can differentiate between the different users. Click here to go to our help page, where you will find FAQs, step by step help videos and guides. Please note, that any reference to 'sQuid' or 'sQuid account' within the help page is applicable to your Cityserve account.